Picture an indoor town square, next to a bookstore, ringed with five cafes. People are talking and eating around long library tables, round tables, square tables, some are working at laptop computers. 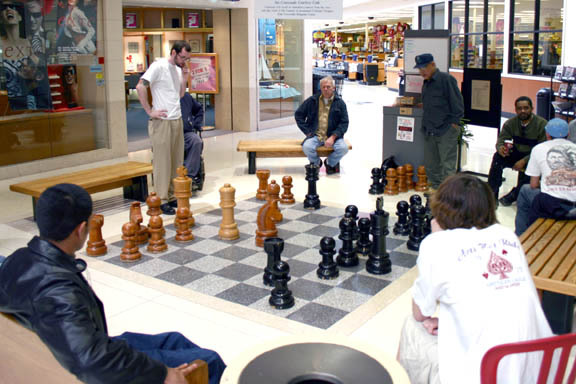 ‍A giant game of chess draws a crowd at Third Place Commons. All ages are enjoying themselves: two middle schoolers play chess with large chess pieces set up on the floor; a four year old pushes his train around a small track on the table while waiting for Mom to bring food. Seniors play Mah Jong at several tables. A book club is discussing their latest novel at another. Up on the stage, sound is being adjusted for a flute player, a guitarist, and a drummer who will soon be playing. This is all the result of a single word: "Yes!" -- uttered enthusiastically and often by Ron Sher, the developer who fashioned Third Place Commons from a failing mall in Lake Forest Park, Washington, just north of Seattle, and by Karen True, Executive Director of Friends of Third Place Commons, a civic group that helps support this indoor square. In 1998 Sher opened Third Place Books, which is attached to a large commons space with a stage and cafes, under the inspiration of sociologist Ray Oldenburg, who observed that humans need three places: their home, their workplace, and a common public space where they can be with others. The once-dreary Lake Forest Park Town Centre mall became a magnet for my family--a comfortable place to watch people, meet friends and colleagues, hold meetings. In Seattle's rainy winter months, Third Place Commons actually became our "community living room". One day in February 2000, I was in line to order my lunch, eavesdropping as usual. Next to me a tall slender man with expressive bright eyes was talking animatedly to the Lake Forest Park City Manager. They were discussing the fact that business wasn't going well. I listened as they commiserated, then I began to realize they must be talking about Third Place Books. So, I introduced myself. Why not have the community that loves Third Place be involved in supporting and running the Commons? It turned out he was Ron Sher, a prominent local developer and the owner of Third Place Books. So I launched into a paean of praise for his vision, and explained how crucial Third Place was to the evolution of community here. "Well, I wish it were as financially successful as it is socially!" he replied. We parted to sit down to our separate lunch dates. Part way through my lunch meeting, I had an idea: Why not have the community that loves Third Place be involved in supporting and running the Commons? I excused myself for a minute, and went across the Commons to interrupt Ron's meeting with my question. His eyes lit up and he said "Yes! That's an interesting idea. What do you have in mind?" I was later to learn that he greeted almost every idea that matched his vision with the same sort of enthusiasm. At that moment, I had nothing in mind, just the question. But we committed to a date for Ron to meet with a small group of local leaders I'd get together to see if there was any interest in helping make Third Place Commons a community gathering place. That group grew into Friends of Third Place Commons--a new non-profit organization that has become the center of a public/private non-profit partnership that includes the City of Lake Forest Park, several local businesses (including Third Place Books), the Shoreline Lake Forest Park Arts Council, the local King County library, a branch of Shoreline Community College, and a host of non-profit and educational community groups. Five years later, Karen True is presiding over the organization that features a staggering variety of offerings from community and nearby groups. Every Music and performing arts include offerings from Lake Forest Park Elementary School students, a community band, Northwest Ballet School, Shoreline Community College Jazz Ensemble, and many more. Friday night at "Magic: The Gathering" a group of high school age people take over the Friends Room at the back of the Commons. Community events and partners collaborate in offerings as diverse as a Gardening Fair, a Care Conversation on Intercultural Communication; grandparent support and education; Parent/Caregiver/Child playgroups; Teen Book Club: Pizza and books; Healthcare Fairs, Transportation Fairs, LFP History Project -- the list goes on. From June through the end of September, Friends sponsored a Sunday Farmers Market. This past year, the Mayor of Lake Forest Park and a community task force invited the community to imagine the Lake Forest Park Town Center of the future. Three community meetings were held--with about 200 citizens at each meeting. One striking common thread: When people were asked, "What is essential to the town center?" they replied, "Keep the indoor Commons."